McLaren: "The P1 is the result of decades of aerodynamic research." Lamborghini: "We hired a seven year old that likes cars to design the Veneno." Lamborghini got it right. 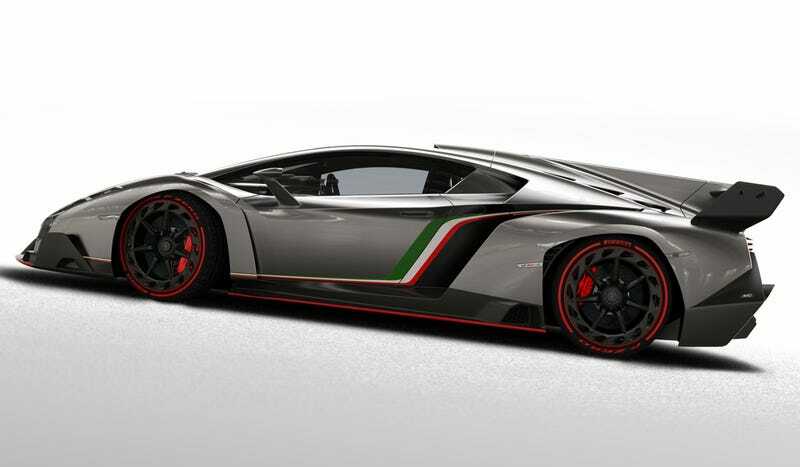 The Veneno is the next fantasy car for kids and adults alike. Here's why. For starters, just look at it. You haven't seen anything like it since that time you were bored in sixth grade math and drew your ultimate supercar. The all-carbon fiber car looks kind of like an FIA GT/LMP car, doesn't it? This also has to be one of the most complicated designs I've ever seen. Everywhere you look there's something going on. The aero detailing is just exquisite. Look at that front end. Sure, it's busy, but I'm sure in person all of those little details will pop. There are four of these worldwide, not three. One white, one red, one green, and the show car, which is silver with the tricolore stripe. That car will only exist in the Lamborghini Museum in Sant Agata and is the only one that will have that stripe. And, from what I've heard, two of the three will be in the United States. They'll be nearly as common on these streets as Camrys. Power is via a tuned version of the Aventador's really weak V12. Thank God they pumped up the jam. We have a 750 horse version under the hood to motivate the amazing ride to 220ish MPH. Price is a paltry 3 million euro, or $3,9 million before taxes. So yeah, it's pricey. But who cares? Don't you look at it and feel like a kid? It reminds me of when I used to doodle in elementary and middle school when I was supposed to be paying attention in math class. Kudos Lamborghini. I freaking love this thing.